The British Household Cavalry, is an army corps (pronounced "core") of two regiments of soldiers. Cavalry regiments, until the end of World War I, were always "mounted" on horses. Nowadays cavalry regiments are mounted on tanks. The British Household Cavalry is unusual because half of them are also still mounted on horses. The two Regiments of Household Cavalry, the Household Cavalry Mounted Regiment, which parades with horses and the Household Cavalry Regiment, which has light armoured vehicles, are manned by equal numbers of soldiers from The Life Guards and The Blues and Royals both of which are part of the "Household Division". In Britain the "Household Division" has the special privilege of guarding the Sovereign and the Royal Household. 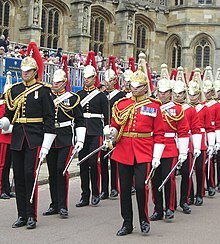 The term "Household Division" is used in all Commonwealth countries. In many other countries there are similar highly-trained army corps which guard the head of state and have ceremonial duties as well as operational military roles. Regiments of this sort can be found in Australia, Brunei, Belgium, Canada, Denmark and many other countries. But when speaking in English of the "Household Cavalry", the term generally refers to the "British Household Cavalry". Soldiers of The Blues and Royals on their way to Horse Guards Parade for The Queen's Birthday Parade, also known as "Trooping the Colour"
In Britain there are seven regiments in the Household Division. They are generally referred to as "The Guards". Five of the Guards regiments are "infantry", which means that they are "foot soldiers" and are Foot Guards, and the senior two regiments are "cavalry" meaning they are first and foremost armoured soldiers who also have a ceremonial role "mounted" on horses for ceremonial duty. The motto of both regiments is Honi Soit Qui Mal Y Pense (Shame on him who thinks evil of it). since 1945: Cyprus, Northern Ireland, Falkland Islands, Bosnia, Kosovo, Iraq and Afghanistan. The ceremonial uniform of the Household Cavalry has two features that are not often seen on other soldiers. They wear a shiny Silver helmet With Brass and Silver fittings, with a long "plume" of horse hair hanging from the top. When on mounted guard duty they also wear a "cuirasse" (metal chest armour). The two regiments can be told apart by the colour of their jacket (which is called a "tunic") and by the "plumes" on their helmets. The Life Guards wear red tunics with white plumes while The Blues and Royals wear blue tunics and have red plumes to their helmets. While on guard, the soldiers carry swords. When mounted on horses, the soldiers wear white riding-breeches, known as buckskins, and tall black winged leather boots, which are called jack boots, having been "jacked" or reinforced against sword blows (Fr. Jaque: chainmail). The "farrier" assists the Regimental Veterinary Officer in of taking care of the horses. When the farrier is mounted on parade, he carries the traditional symbol of an axe. In battle, one of the farrier's jobs was to kill horses that were badly injured. They also had to cut off one of the hooves so that there was proof of the horse's death so that a new one could be purchased. The horses are all black three quareter bred Irish draught horses except for the trumpeters' horses, which are grey, and the drumhorses which are large draught horses. They are almost invariably coloured horses, Shires or Clydesdales and are "piebald" (black and white), "skewbald" (brown and white) or roan. The drumhorses each carry two solid silver kettle drums on parade. The trumpeter, whose job is to relay messages by trumpet, can be told apart because he does not wear a cuirrass, and has a grey (white) horse. On "State occasions" when The Queen or another member of the Royal Family is present, the bands of The Household Cavalry wear gold coats designed at the time of King Charles II made of gold braid and dark blue velvet jockey hats. Each regiment has its own Quick March and Slow March. They both use a Scottish tune the Keel Row for a ceremonial "trot past". The Household Cavalry Regiment is an armoured reconnaissance regiment based in Windsor. Most Household Cavalry soldiers begin their careers on mounted duty before being posted, normally after about two years at ceremonial duty, to the reconnaissance regiment, which has Scimitar light tanks, where they are trained in driving, gunnery ands signals. This regiment has deployed more than almost any other in the British Army to operations in Bosnia, Kosovo, Iraq and Afghanistan. Gallantry medals awarded to soldiers of the Household Cavalry since 2003 include: a George Cross (GC) to Trooper Christopher Finney of The Blues and Royals, a Conspicuous Gallantry Cross (CGC) and a Military Cross (MC) to Staff Corporal Michael Flynn of The Blues and Royals (making him the most decorated serviceman in the British Army), a CGC to Lance Corporal of Horse Andrew Radford, a Distinguished Service Order to Major Richard Taylor of The Life Guards, and MCs to Captain Paddy Williams of The Blues and Royals and to Staff Corporal Shaun Fry of The Life Guards. All these were awarded on operations in Iraq and Afghanistan. H.M. Queen Elizabeth, Colonel in Chief watching the "Trooping of the Colour" in 2007. Her Royal Highness Princess Anne, The Princess Royal, is the Colonel of The Blues and Royals. She can be seen in uniform to the right of the picture. Michael Flynn (Blues and Royals) currently the most highly decorated soldier in the British Army. The Blues and Royals at the "Trooping of the Colour"
The Mounted Bands of the Household Cavalry at the "Trooping the Colour" salute H.M. Queen Elizabeth II as they ride off parade. This page was last changed on 14 January 2019, at 03:03.